Back to school means back to school lunches. My son until now, has had school dinners. Why? It was convenient and economical as in KS1 all children are entitled to hot meals for free. And, with a little boy that is ‘picky’ watching other children try a variety of nutritious foods has encouraged healthy eating habits and develop social skills by eating and relaxing with others. (He is seven, so we do still have broccoli related battles.) Thanks to Jamie’s influence on government–legislated dietary requirements schools offer a daily selection of freshly cooked foods and provide up to three of your child’s five a day portions of fruit and vegetables. Now my son bravely steps into Year 3 and wants to mix and match school meals and home meals. What is the best item to send children’s lunches to school in? Box, bag or both?! When I was a child the only choice was a bulky plastic box. Mine had My Little Ponies on. With books, P.E kits and hundred other things children must drag to school lightweight, soft-sided, insulated lunchbox bags have become more popular. Packed lunches of old used meters of clingfilm to separate foods which was not the safest or most environmentally friendly choice! Individual plastic containers allow for more flexibility and are useful to protect soft foods. Sandwich and snack bags offer a space saving alternative and are my top lunchbox go to! Grab a box of Bacofoil® All Purpose Zipper® Bags! Introducing the very best all-purpose reusable (so less waste) bags. Dishwasher safe, they clean really well, don’t leave any residue and are sturdy enough that the food in them doesn’t get totally smooshed. They have an essential zip tight seal, keeping food fresher longer ensuring no leaks or mess! The Zipper® closes easily and safely, easy for kids to open. They are also tear proof so survive even the most enthusiastic little hands. The convenient standalone base; also makes the Bacofoil® All Purpose Zipper® Bags easy to fill and store so storing and transporting little lunches has never been easier. School meals ideas for busy families. Perhaps your kids have just taken on that high-pitched whine of ‘but that’s boring!’ when they see yet another cheese and ham sandwich? Too tired to feel inspired? Check out our child-approved mix and max food plan for school packed lunches that kids will eat. In all honesty I am not the most culinarily creative mum on the street, or in the town, or well, ever! When scrolling through Google masterful, artistic lunchbox creations pop up that look like they should belong in the Tate. It just isn’t me. Time is not this mums’ friend so if you want healthy, easy meal ideas that combine homemade bites and snacks that you can grab at your local supermarket look no further. If you are looking for something that included Chia seeds and Kale, this is not the post for you. My son would never eat it. Even if bribed with Pokémon cards and cash. A week of school eats. You want to be including protein, dairy, carbohydrate, fruit and vegetables. Guidance advises no confectionary or crisps, but I am more of an everything in moderation advocate. Why not add a little pot of crisps or popcorn or rice cakes, rather than full packets? Make lunchboxes more interesting by using wraps, bagels and pitta to keep children fuller for longer or mix grains in slices of bread by making a sandwich from one slice of white and one slice of wholemeal. Fill up with tuna and sweetcorn pasta, yoghurt, an apple, with some cheese, ham and pitta tapas shapes (Tip Pre-cut the apple then put it back together with string to stop from browning.) Sneak in a flapjack for a tasty treat. Tuesday: Cheesy chow. No Sticking, No Cleaning, No Worries. Make sure lunch box preparation is quick and easy with the help of Bacofoil’s® The Non-Stick Kitchen Foil with BacoLift® surface. Whip up some tasty cheese twists and bake on the non-shiny side of The Non-Stick Kitchen Foil, with no need for oil and minimal washing up! The twists will simply lift right off the foil, leaving the food looking like it should. Add homemade or shop bought humous, cucumber and carrot slices. Add in chocolate buttons and a box of raisins for afters. Grate some cheese and apple together for extra yum. By the time I master the stylish kids Bento box, my son will be middle aged. That said creating a pick and mix affect with some small Tupperware pots can make food look much more attractive to kids. Got something like mince left over from a spaghetti Bolognese? Wrap little mounds of the sauce in puff pastry for little hand pies. Add in a fruit salad with a dash of orange juice, cereal bar and squeezy yoghurt. For the savoury choice add cheese crackers and a squeezy tube yoghurt. Instead of chocolate bars do a sweet swap for a wrap filled with Nutella, with banana and blueberries added for good measure. My son will complain if he is given the same thing two days in a row – yet at the same time is pretty rubbish at trying new things! How about a no sandwich lunch? Everything’s better on a stick, try cheese cucumber and bread skewers (with tomatoes if you are feeling brave). Interactive food is a great way to get your kids excited about their meals. If you have a younger child use a pretzel or breadstick rather than a kebab stick. 10 of our best tips and tricks for making great school lunches. Don’t go rouge. Pack food you know your kids will eat. Pack small portions. Let you kids get involved with the preparation and choosing of what’s in their lunch. We have Fantastic Fridays where, within reason, my son can pick his own lunch. Keep all the lunchbox Tupperware, zipper bags, drinks bottles etc in one handy place all together. Buy more than you need. Some will never make it home. Make sure their containers aren’t too fiddly for them. LABEL THE CRAP OUT OF EVERYTHING. Make lunches ahead of time like while you’re already making dinner, or right after dinner but before you do the dishes; the kitchen counter is already messy, some of the items you’ll use might already be out, and all the cutting boards and utensils can go straight into the dishwasher. On a Sunday chop up lots of different types of fruit/veg and have them stored in separate boxes in the fridge ready for the week ahead. Wrap sandwiches in moist paper towels before refrigerating them to prevent the bread from drying out. Have a rule that uneaten food and rubbish comes home in the box to get an idea of what they are eating. As soon as your child comes home at 4pm ask them to bring their half eaten, sweaty lunchbox to the kitchen, empty it and put contents to soak! 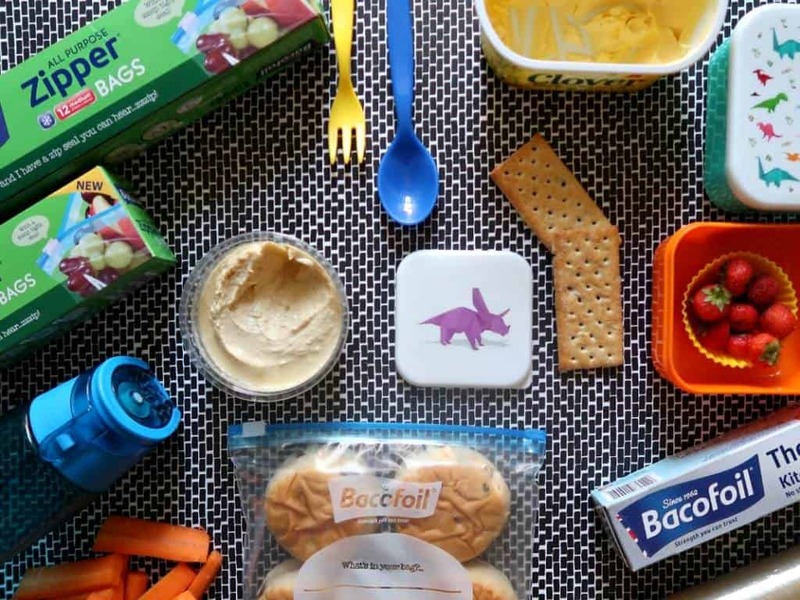 Pack a little fun into your kid’s food. If like me, you are no Annabel Karmel it does not mean you cannot get a little creative with a lunchbox. Customise wooden cutlery, use cookie cutters and sandwich cutters. Spoons with capes. Stickers, jokes and post it notes. Decorative pots and smiley faces of food. Doodle on your Bacofoil® All Purpose Zipper® Bags! Do you dread making packed lunches, or have any hacks that save you time? What are your children’s favourite snacks?